Who are the biggest fantasy football sleepers and busts for Week 14 of the 2018 NFL season? We use advanced matchup analysis to bring you a list of players who will overperform (sleepers) or underperform (busts) their typical production. Below are some of the top sleepers and busts for Week 14. Rodgers is fantasy’s QB9 on the season — good, but far from Rodgers’ typical standards — and he’s fantasy’s QB23 over the last two games. His skid ends in Week 14 against the Falcons, who have given up the second-most fantasy points per dropback (0.59) this season. With fewer than 150 passing yards in three straight games, nobody is calling Rosen a slam dunk this week, but he is in a good spot to success against the Lions, who have given up the fifth-most fantasy points per dropback to quarterbacks (0.56). Rosen recently found success against other soft pass defenses, with three touchdowns against the Raiders (last in fantasy PPDB given up) and 49es (ninth in PPDB). Edwards hasn’t found the end zone in two straight games, but his volume is bankable and he has a great matchup against the Chiefs, who have given up the second-most fantasy points per touch to opposing backs while surrendering a generous 5.1 YPC average. Edwards is averaging over 20 carries since assuming the starting role with a YPC average of 5.0. He should eclipse 100 rushing yards and fall into the end zone at least once. All eyes are on Melvin Gordon’s health, but he seems to be on the wrong side of questionable still, and most people are talking about the exciting Justin Jackson as a viable waiver wire pickup for a favorable Week 14 matchup against the Bengals, who were just lit up by Phillip Lindsay and have given up the fifth-most fantasy points per touch to running backs this season. While Jackson is a good pickup, let’s not overlook Ekeler, who has the same great matchup, is the starter (if Gordon misses), all while averaging 1.18 points per touch — top 15 among qualifying running backs. Robinson goes to battle against the Rams secondary, which has given up the most fantasy points per target in the NFL (2.26). Robinson has displayed his ceiling against other weak secondaries — he torched the Lions, who rank second-to-last in points per target allowed, for 6-133-2 — and the Bears expect starting quarterback Mitchell Trubisky to be back under center. 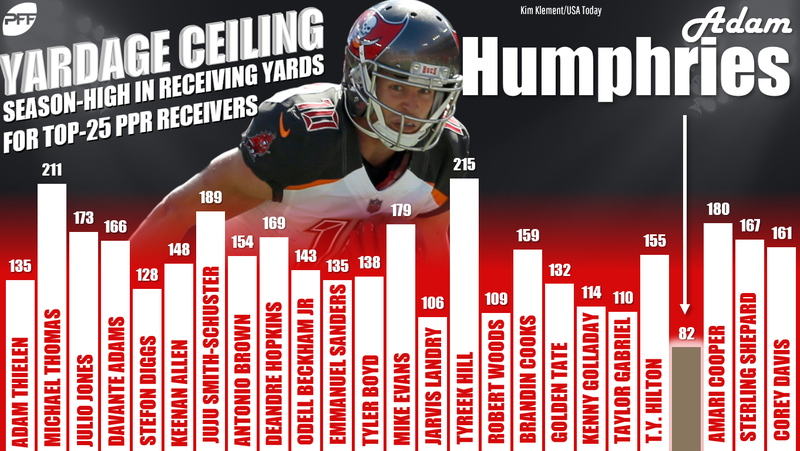 Humphries has been on a roll. In fact, over the last five weeks, he ranks ninth (!) among all receivers in fantasy points. He doesn’t have a high yardage ceiling — his season-high is 82 yards — but he does have a nice floor, with at least 50 receiving yards in six straight games. This week, he gets Saints slot man P.J. Williams, our second-lowest-graded slot corner (40.1). McDonald has at least three receptions in seven straight games, but he has fewer than 30 yards in four of his last five. He’s due for a big game, and it should come in Week 13 against the Raiders, who have given up the most fantasy points per target to tight ends. Chiefs tight ends posterized the Raiders for 15-207-3 last week, just to give you an idea of how south things can go with this defense. Gronkowski flopped last week against the Vikings, posting a weak line of 3-26-0. He now has just three receptions in four straight games. But he has seen high usage in the red zone recently and he has a plus draw against the Dolphins, who have given up the fifth-most fantasy points per target to tight ends. Luck was stomped by the Jaguars pass defense en route to the first shutout of his career. He’ll traverse rocky waters again in Week 14 against the Texans, who have given up the fourth-fewest fantasy points per dropback to quarterbacks this season. The Texans have held opposing quarterbacks to 1 or fewer touchdowns in seven of their last eight games. Goff and the high-flying Rams offense travels to Chicago to face one of the best defenses in the NFL. 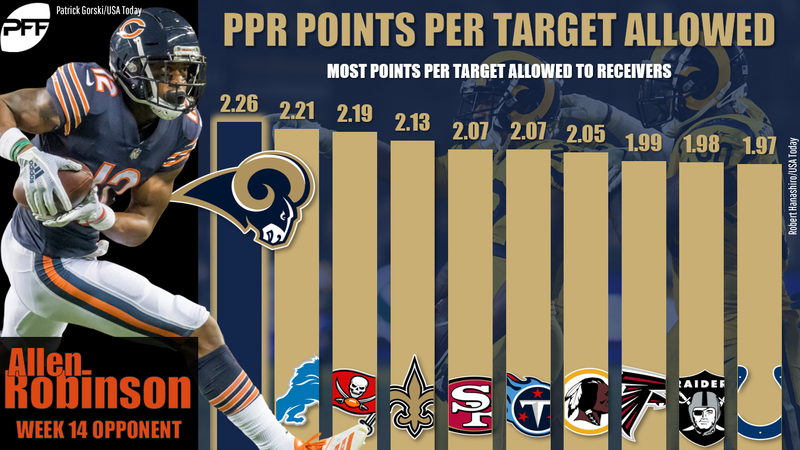 The Bears have given up the second-fewest fantasy points per game to quarterbacks and the fewest fantasy points per dropback. Only two quarterbacks —Aaron Rodgers and Brock Osweiler (ha) — have topped 280 passing yards against the Bears. Carson remains the Seahawks starting running back, but he is losing work to Rashaad Penny and Mike Davis. Carson now has fewer than 85 rushing yards in four straight games after going for over 100 in three of his preceding four. Carson and the Seahawks get the Vikings defense in Week 14, who have given up the fifth-fewest fantasy points per touch to running back. 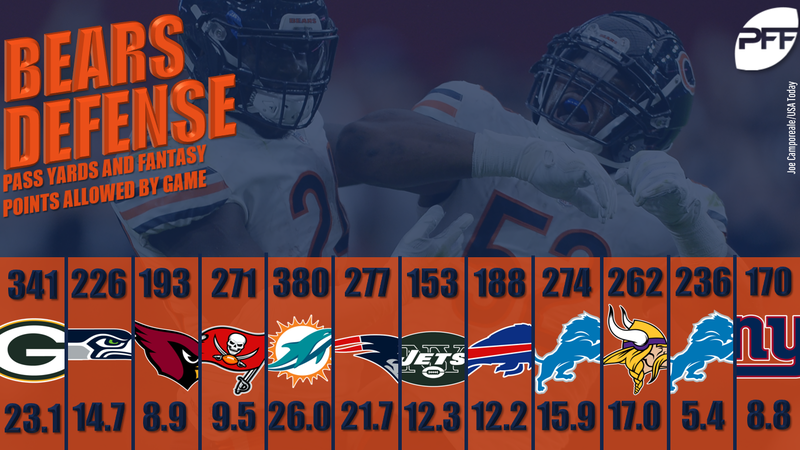 Ware was surprisingly ineffective in Week 13 against the weak Raiders rush defense, and things only get harder in Week 14 against the Ravens, who have given up the third-fewest fantasy points per touch to running backs. Funchess returned in Week 13 and caught a touchdown, but it was his only reception. He had three targets, which paled in comparison to D.J. Moore (8 targets) and Curtis Samuel (11 targets). Health was a factor, and Funchess figures to see more action as he gets closer to 100%, but he’s a prime bust candidate again in Week 14 against the Browns, who have given up the fifth-fewest fantasy points per target to wideouts. Davis will be shadowed by Jalen Ramsey on Thursday night. Ramsey, playing through an injury, is still a shutdown corner when playing anyone not named Antonio Brown. Ramsey has allowed just two touchdowns this season — one to Brown and one to DeAndre Hopkins. Brate’s usage in Tampa predictably rose after O.J. Howard was ruled out for the season — he had a season-high six targets last week — but he’s still far too touchdown dependent. Brate hasn’t topped 40 receiving yards in any game this season, and now he gets a Saints defense that has given up the second-fewest fantasy points per target to tight ends. New Orleans has also given up just one touchdown to the position this season. Hooper faces a Packers defense that has given up the third-fewest fantasy points per game to tight ends this season. Green Bay has allowed just one enemy tight end to score against them this season.